Her detailed knowledge of the unique needs of each of our partners is a huge part of what makes our channel relationships some of the best in the business. I know our partners would agree that this recognition is richly deserved. 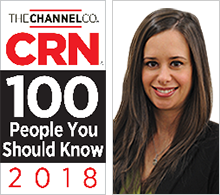 Tripp Lite, a world-leading manufacturer of power protection and connectivity solutions, announced that CRN®, a brand of The Channel Company, has recognized Michelle Wang, Director of Marketing – U.S. Channel, as one of 100 People You Don’t Know But Should in the IT channel for 2018. This annual list is compiled by the CRN editorial team, using feedback from solution providers and industry executives, to acknowledge channel management team members from the industry’s top vendors and distributors. Those recognized on this list work diligently to drive innovation, profits, and successful partnerships, keeping the IT channel growing and their firms thriving. CRN has also recognized Wang in its Women of the Channel list several times, most recently in 2018. Wang has worked in Tripp Lite’s U.S. channel marketing organization for the last 17 years, rising from a valued team member to lead the group. During this time, Tripp Lite increased its product portfolio by 600 percent and received numerous awards for channel partnership excellence, including five-star partner recognition from CRN and partner of the year from CDW and Insight. Wang and her team focus on strengthening relationships with key partners while implementing Tripp Lite’s channel strategy, building brand loyalty and optimizing web content to boost unassisted sales. Wang also excels as mentor. In late 2017, she founded Tripp Lite’s GROW, a collaborative employee network dedicated to cultivating the careers of women within the company. More than 60 percent of Tripp Lite’s female employees are actively participating. The 2018 list of 100 People You Don’t Know But Should will be featured in the October issue of CRN and can be viewed online at http://www.crn.com/100people. Outstanding product reliability and exceptional service have been Tripp Lite trademarks for over 95 years. Tripp Lite´s innovations include the world’s first UPS system designed specifically for personal computers and the world’s most trusted premium surge protector—the Isobar®—with more than 19 million in use. Tripp Lite maintains the highest level of ready-to-ship inventory in the industry with more than 4,000 different products, including UPS systems, rack systems and cooling solutions, PDUs, PowerAlert® software for enterprise-level system management and control, surge protectors, KVM switches, cables and connectivity products, inverters, power strips and notebook accessories. Headquartered in Chicago, Illinois, Tripp Lite maintains a global presence with fully staffed offices worldwide. Additional information, including a list of Tripp Lite’s sales offices and authorized reseller partners, can be found by visiting Tripp Lite’s website: http://www.tripplite.com.